I rarely take pain meds for something as ‘trivial’ as joint aches. But I popped one that day as I had work to do the next day, and I needed all the energy a good night of sleep could provide. Don’t get me wrong, these aches aren’t trivial at all, but I try to minimise my dependance on medications, for fear that I will have nothing left to control the major pain flares when they do hit. All it took was for my partner to flip over on his side in bed, for me to go into a meltdown. I was probably running a high temperature then already, but hadn’t yet realised it. I spent the next two hours bawling my eyes out for ‘no reason’, feeling mentally unsound and physically drained. I have since come to realise that I get extremely emotional and snappy when I’m having a high fever, both as a cause and effect. I live in the tropics, but shivered as if I were naked on a tundra. Even with the air conditioner turned off, I was wrapped up in a thick bathrobe while hugging a hot water bottle under the blankets. It went on like this for three days, before I decided to go to the A&E. My partner wasn’t too worried and didn’t think that it was anything too bad. ‘Food poisoning’ was his probable conclusion. It isn’t that he doesn’t care, but because he’s seen me in a maelstrom of a Lupus/Sjögren’s flare, and the horror of pain then. And trust me, I was reluctant to go to the A&E myself; it’s like a cuss word to a person with chronic illness. Nobody likes being hospitalised, especially if you’ve been in and out so many times, with severe pain as associated memories. I timed it such that it was off-peak hour and was fortunate to get a gentle and skilled doctor, which is akin to a miracle in the ER. It was the first time that someone had taken arterial blood from me without making me cry out involuntarily in reaction, due to the landmine of nerves they sit amongst. Five minutes after collecting all the regular blood samples, he said, ‘Oops sorry. I forgot one more tube for dengue’. An offhand statement. A general precaution. Neither of us thought much of it. Thirty minutes later he rushed back to my bedside and informed me that I had dengue fever. I was a little surprised. Dengue? Really? 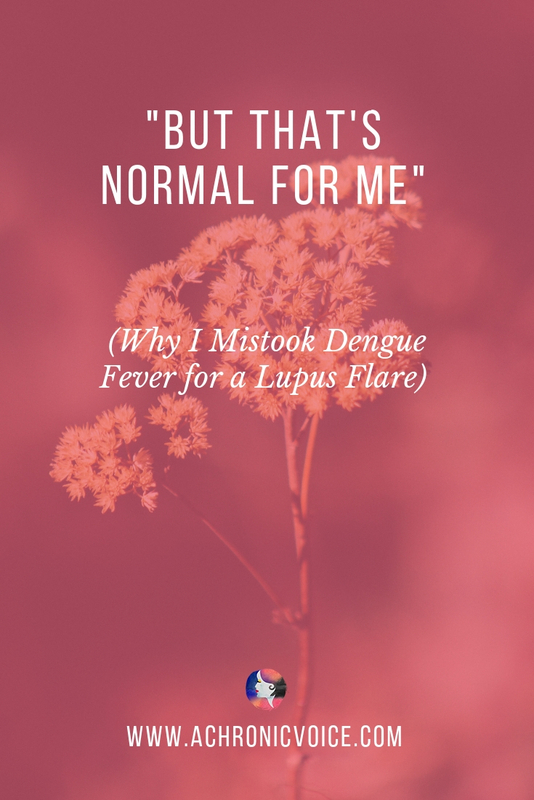 Are you sure it isn’t ‘just’ Lupus? But then again I’ve been quite the ‘lucky’ girl over the years, having acquired tuberculosis, dengue, and other mysterious ailments off the streets. I didn’t even have to be near any infected clusters, and all it takes is a few seconds for me to catch bored bugs with nowhere to go, and nothing to do. They got me a bed in the ward pretty quickly, where I was kept hydrated through a drip for a whole week. It’s not quite fun having a bulky extension for an arm everywhere you go, but I hardly had the strength to leave my bed much anyway. One of the worst nights was when I was having a a high fever with violent chills. The night doctor, Boulder Thng, frantically checked me for rashes. Seeing that they were more or less in the same state, he simply left me to my own devices. As long as I hadn’t gone into shock, he didn’t seem to care. I was shivering too much and had to pee in a bedpan, but ended up wetting the entire bed. The nurses wanted to just wipe me down, but I forced myself to the bathroom, and allowed them to shower me at 5am. Whilst I know that it isn’t wise to shower in hot water when you’re having a fever that’s over 40 degrees celsius, it felt good. In some sense it helped, because I was ‘warm’ enough to stick on a cool fever patch after. 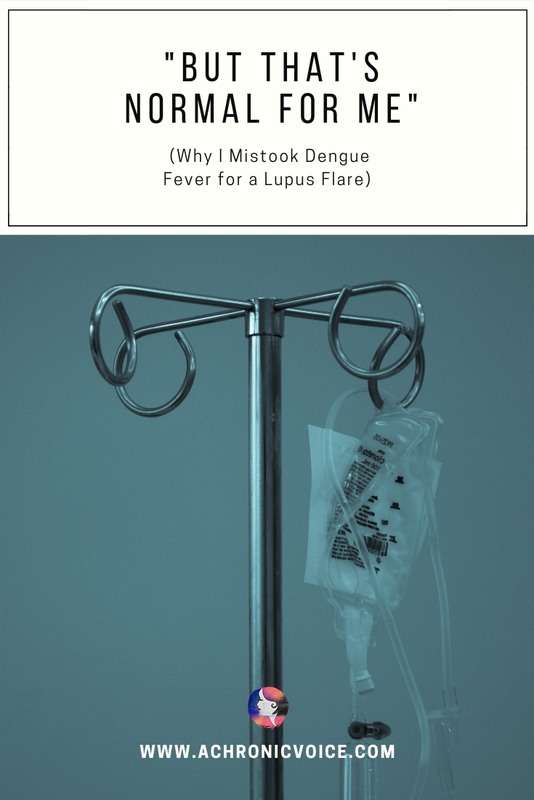 I suppose it’s easy to see why Lupus (SLE) is known as ‘the great imitator’ (although, Sjögren’s Syndrome does have close overlaps as well for me). 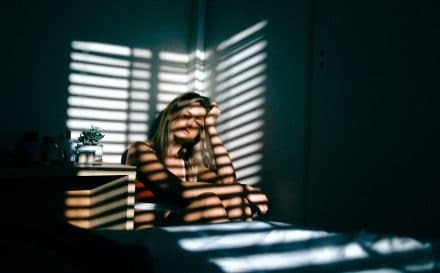 Just about any generic symptom or side effect could be caused by Lupus, ranging from something simpler such as an itch, to something more severe such as haemolytic anaemia (where your red blood cells keep disintegrating). 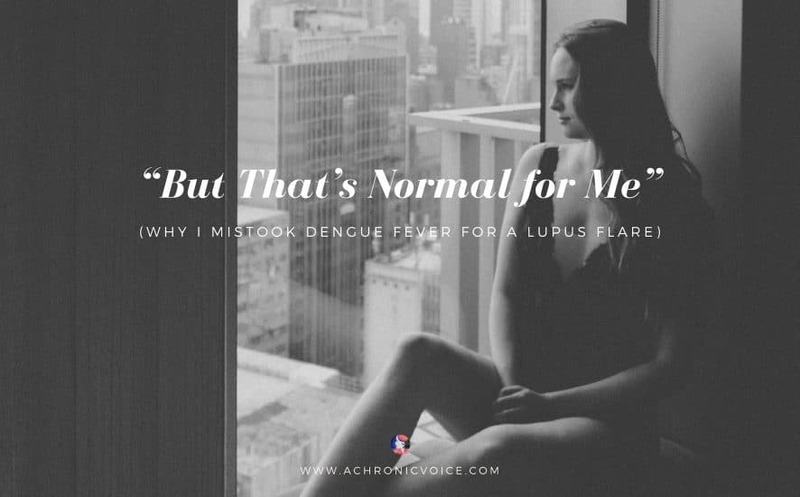 For the entire duration of my stay there, it was difficult for even the doctors to differentiate between dengue and Lupus symptoms. Whilst the senior doctors were of course more discerning, the on-call, junior and night doctors were mostly just bumbling along, clueless. As long as I was alive and hadn’t progressed to a dangerous state of shock, they didn’t dare to touch me. The fevers tend to last for about 4 – 5 days before subsiding on their own; there isn’t much you can do except to keep yourself hydrated and wait it out, as dengue is a viral infection. I saved my ibuprofen tablets and timed them to perfection, as I didn’t want to be caught with my pants down again, literally, in the middle of the night when inflammation is at its worst. That can be a double combo hit when you include existing chronic pain and health issues. As my fevers were high and dragged on for seven days the doctors got a little worried, and started to test me for other infections, of which they found some. In general with a suppressed immune system, there usually are co-infections or extra bugs that join in the party. Additional painful sores and an early period were not helpful either. I was finally allowed to go home when my blood counts looked to be fairly stable. And as anyone with chronic illness knows, there is no other feeling like home sweet home. What was sad is that many of the elderly patients who shared the ward with me actually did not want to go home, as there was no one to look after them there. Many of them have had falls and accidents, and have developed fears of moving around on their own. I find it sad when one actually considers a shared hospital room better than the privacy of their own home, due to the lack of support. As such, I wish everyone a life filled with good health, luck, and hope that the rest of 2019 will be better for us all. This is such a powerful story! I’m sorry you had to endure all that. Thank goodness they were able to figure out that your problem was much more serious than your usual chronic illness symptoms! I’m so glad you received the proper treatment and were able to improved and go home, even though it took so long. What an ordeal! I have definitely been guilty of chalking things up to lupus that were not lupus, but not on this scale (yet). I hope your year improves! Thanks Ava! Well it wasn’t so long (compared to chronic illness! ), which was actually the main point I was trying to make with this article (was trying to use it to raise more awareness, heh). I’m sorry you had to go through that. I can totally relate to not knowing if symptoms are a flare or caused by something else. Oh my gosh, how scary! How are you now? 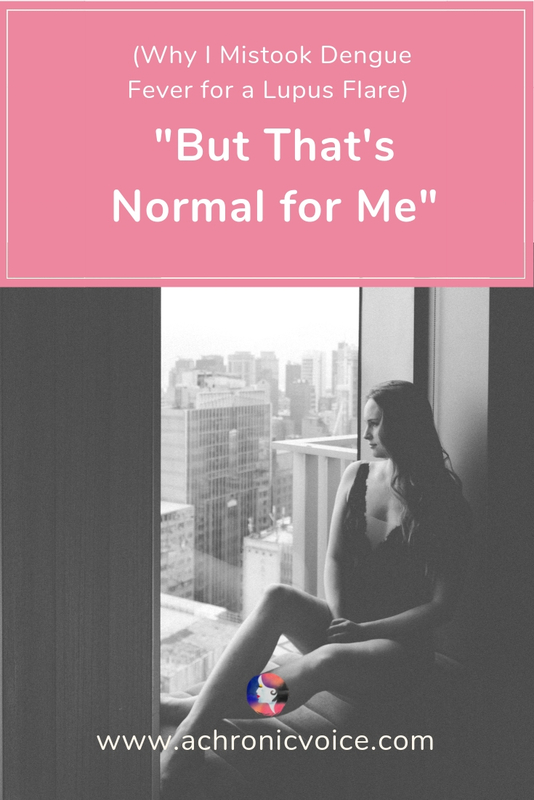 When we live with chronic health conditions, it can be super hard to distinguish between what is kind of ‘normal’ for that and what isn’t. This shows just how difficult it can be, and even possibly life threatening. I was in Asia last year for my honeymoon and fell very ill. I thought I was just in a flare at first but ended up in hospital with a nasty virus. It was really nasty. Yes it can be scary. This isn’t the first time that something really bad has happened that I’ve waited out at least 2 – 3 days before visiting the ER. I’m sure you do the same sometimes 🙁 This is also partially from learned experiences, where sometimes it really is just a flare and nothing else. So…therein lies the dilemma (and stress!). Sheryl, what a terrible time you had. When all those symptoms are normal, it is just so hard to know when you need to see a doctor rather than try to look after yourself at home. I had something similar happen. I had been putting up with pain thinking it was back and rib pain and just ‘normal’ feeling terrible, thinking it was either side effects of meds or just generally feeling crap because I get days like that. Turned out I had pancreatitis (due to gallstones). Not as serious as Dengue fever, but I was on a drip being monitored for a few days, then had to have my gallbladder removed as an emergency. My husband was a bit like your partner at the time too, because he is so used to seeing me with pain and all the associated symptoms. I hope you are picking up now. I know you’ve had a really tough time for the last few months.